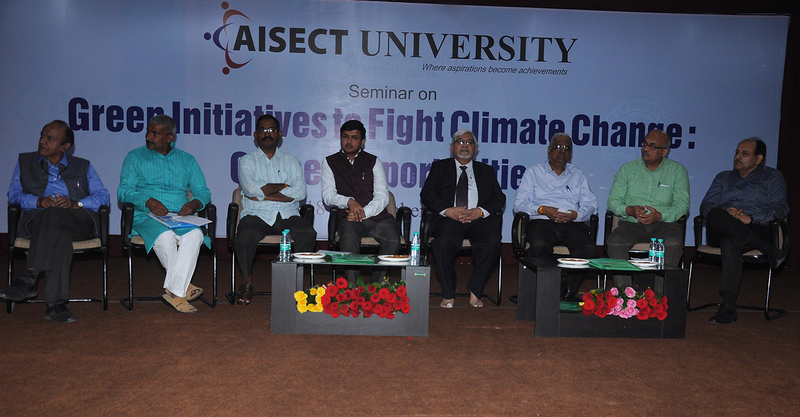 AISECT University - Madhya Pradesh organised a National Seminar on " Green Initiatives to Fight Climate Change: Career Opportunities". Dr. Navin Chandra- Director General, MP Council of Science & Technology was the Chief Guest of the event. Shri Vibhash Trivedi- Skill Council for Green Jobs, New Delhi, Shri Rajesh Chourasia- Director CEEPL, Bhopal, Shri Sunil Sood- Advisor Green Duniya, Bangalore, Shri Jai Shankar Kumar- Agriculture Scientist, Begusarai Bihar, Prof. Rama Pandey- School of Planning & Architecture, Bhopal along with Shri A.K. Gwal- Vice Chancellor AISECT University M.P. Shri Nitin Vats, Shri Amitabh Saxena- Pro Vice Chancellor AISECT University M.P. and Dr. S.R. Awasthi- Director, Center for Renewable Energy graced the event.